Asia and Europe are the homes of the best Table Tennis players in this world. But which is stronger? There's only one way to find out and that is the 2016 Asia-Europe All Stars Challenge. 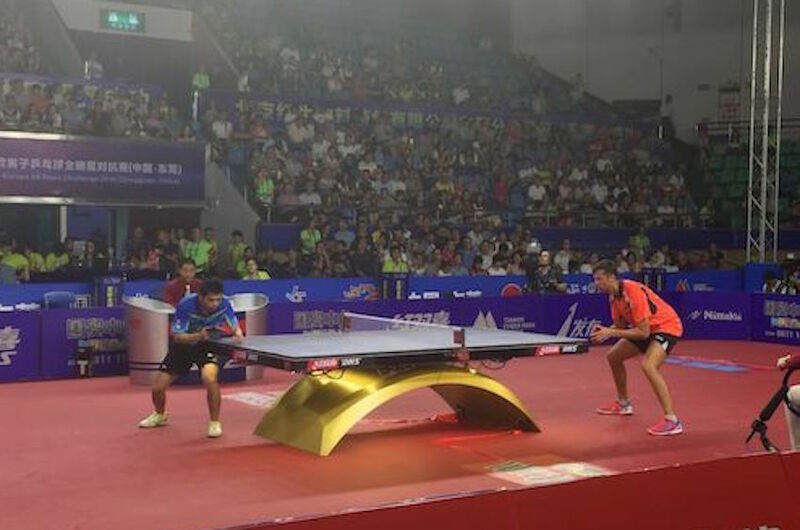 The opening leg of the two-day competition progressed today in the Chinese city of Dongguan. Last year, Ma Long contributed two points to the Asian Team in Zhangjiagang. He defeated Marcos Freitas and Vladimir Samsonov. However, the Asian Team was not able to capitalise on such advantage. Bastian Steger, Andrej Gacina, Robert Gardos, Marcos Freitas and Vladimir Samsonov secured the victory for the European Team in 6-4 score. Would they be able to have a repeat this year? Well, things are looking difficult for the European Team this time around in the Chinese city of Dongguan. As the first leg of the 2016 Asia-Europe Challenge unfolded today, September 10th, European players already posted defeats. Russia’s Alexander Shibaev gave the European Team a good head start today. He overcame Hong Kong’s Wong Chun Ting in a convincing manner. Scores registered were 11-9, 8-11, 14-12, 21-19 in favour of Shibaev. But such victory didn’t set the tone for the European Team. Asian players started to establish their control in the second match. Joo Saehyuk had his solid defences up against Andrej Gacina of Croatia. The veteran from Korea Republic posted a sweeping first point for Asia in 11-4, 11-9, 11-4. The Chinese teenage sensation, Fan Zhendong supplemented with a 3-0 performance against Tiago Apolonia in the third match. Portugal’s Apolonia put up a good fight but the Chinese player was very resistant. Fan Zhendong sealed the match with 11-7, 11-4, 11-6. The fourth match was between veterans Chuang Chih Yuan from Chinese Taipei and Vladimir Samsonov of Belarus. It was an action-packed match that led both players into the decider. Chuang offered the third point for the Asian Team with 7-11, 11-5, 7-11, 11-7, 11-5. Singapore’s Gao Ning and Chen Weixing of Austria were the last players for the day. Although it was the last order for the opening leg, both players did not disappoint the crowd. Chen Weixing was leading in 2-0 but his opponent was starting to stage a comeback in the third game. Chen was caught off-guard and lost control. Gao Ning scored 9-11, 8-11, 11-9, 12-10, 11-7. At the end of the first leg of the competition, Asia leads in 4-1. Day 2 of the competition is scheduled tomorrow, September 12th.